Ivan Brkljačić was born on February 28th 1977 in Belgrade, Serbia. He graduated in 2001 from the Department of Composition and Orchestration at the Faculty of Music in Belgrade, with prof. Srđan Hofman. 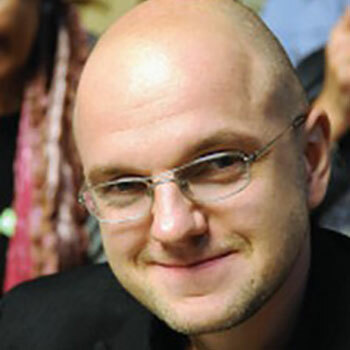 In 2005 he completed his postgraduation studies in composition at the same University, with prof. Zoran Erić. He is now in the third year of the PhD studies in composition with prof. Srdjan Hofman. He attended master classes for young composers in Ohrid – Macedonia, Warsaw – Poland, Graz – Austria and Ostrawa – Czech Republic. The works of Ivan Brkljačić have been performed numerous times in Belgrade and Serbia as well as in the rest of Europe, Brasil, and Australia (in april 2010 The World New Music Days in Sydney were opened with his composition “Jinx” in the performing of Australian Modern Music Ensemble with conductor Daryl Pratt). Ivan Brkljačić had the first author’s concert in april 2006, in the Mokranjac Hall in Belgrade. He wrote music scores for numerous theatre companies and troops in Belgrade, as well as for companies outside Belgrade: Toša Jovanović in Zrenjanin, Sterija in Vršac, National Theatre and Children’s Theatre in Subotica, National Theatre in Banja Luka (BiH), City Theatre Podgorica (Montenegro), the scene Holdvilag in Budapest, Hungary. In 2000 he was a member of the Yugoslav / German theatre coproduction in Erlangen. From 1999 till 2005 he worked as a teacher of the music form analysis in Secondary Music School Mokranjac in Belgrade, and since the academic year 2005/06 he works as the assistant professor at the Faculty of Music in Belgrade, at the Department for Theoretical Subjects. He is the artistic selector of the 16th, 17th, 18th and 19th International Review of Composers and is the creator of a new concept of the Review that was presented in 2007 with the subject Retrospection, in 2008 New miniatures, in 2009 The echoes of space and in 2010 Music theatre. He was awarded the Mokranjac Prize for the year 2005, for his work When the Curtain Raises Seven Times, for symphony orchestra. Brkljačić has written 3 theoretical essays: Music theatre, John Lennon – one piece of art in 175 entireties and Wind Quintets of Dejan Despić. This piece is inspired by the Large Cauldron (in Serbian language: Veliki kazan), the most beautiful part of the Djerdap Gorge created by the river Danube, which forms the natural frontier between Serbia and Romania. Having in mind that Romania is an EU member state, and thinking about the interstate borders, I concluded that the quickest possible route from Serbia to the European Union is across the Djerdap Gorge. Besides being the fastest, the „crossing“ at this particular spot is also the most interesting, due to the natural beauty and rich historical and cultural heritage of the site. Another thing: there is no such thing as a „no-man’s land“ on this crossing. To me, the context of cultural cooperation between European musical festivals which prompted the commission of this piece, was very inspiring for the creation of music. That is why in this piece the fragments of Beethoven’s Ninth Symphony can be heard, which is the official anthem of the European Union. Apart from that, different types of primitive communication between the people who are situated on either side of a borderline can be found in the piece. Finally, there are sounds which can be associated with the flow of the river Danube. The number of different percussion instruments required for this piece corresponds to the current number of member states of the European Union.